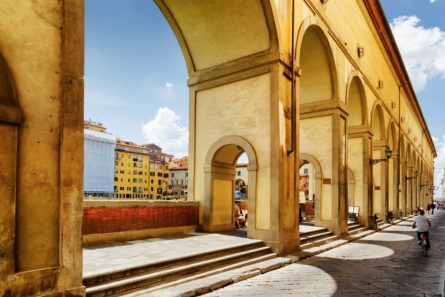 Experience this exclusive visit of the ancient enclosed passageway which connects the Palazzo Vecchio with Palazzo Pitti and have the privilege following the footsteps of the “Prince’s itinerary” during this exclusive Vasari Corridor tour. Designed by renowned Renaissance artist and architect Giorgio Vasari, the corridor, which is not open to the public, contains an exquisite painting collection that dates back to the 600’s and 700’s as well as several artist self-portraits. Your private English-speaking guide will open the door just for you and lead you though the collection, whilst explaining the beautiful artworks, and talking you through the breathtaking views over the hills, the Arno river, its bridges, the palaces and churches of the city. This exclusive access will be preceded by a guided tour with skip the line access of the Uffizi Gallery, the greatest picture gallery in Italy, if not the world-, showcasing masterpieces by every major Florentine painter from Giotto to Michelangelo as well as a plethora of other artists. the Uffizi Gallery, the greatest picture gallery in Italy, if not the world-, showcasing masterpieces by every major Florentine painter from Giotto to Michelangelo as well as a plethora of other artists.